Feel the surge of radiance with Yu-Gi-Oh! 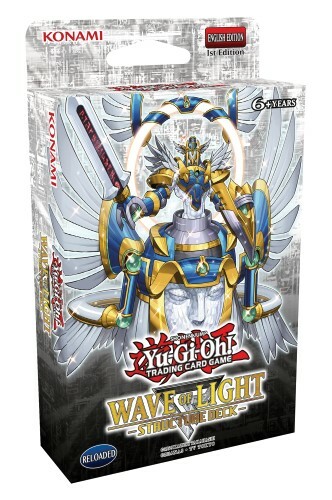 TRADING CARD GAME Structure Deck: Wave of Light! Fairies are back in a big way this New Year, harnessing a bounty of wisdom to counter anything their foe throws at them. You get to make the final call on what resolves with Yu-Gi-Oh! TRADING CARD GAME Structure Deck: Wave of Light! This 41-card themed Deck takes the popular Counter Trap Fairy strategy to new heights. Airknight Parshath is back and more powerful than ever. A massive 2800 ATK makes this new form the strongest Parshath yet, and its synergy with Counter Traps allows it to either descend from the sky or resurrect itself if it has fallen. A new Field Spell fills the role of The Sanctuary in the Sky while also providing your Fairies with added protection. There is also a Counter Trap that not only negates any effect, but Summons any Parshath from your Main or Extra Deck! All of these cards and other brand-new Fairies play off of the Counter Trap Fairy synergy, making Yu-Gi-Oh! TRADING CARD GAME Structure Deck: Wave of Light a streamlined strategy right out of the box! Even an unidentified extraterrestrial biological entity has lost its way and crashed landed into this Structure Deck. With all of the extravehicular activity and Fairies coming down from the sky, you can see why Yu-Gi-Oh! TRADING CARD GAME Structure Deck: Wave of Light is out of this world!